Design unique covers exclusively for your Finao ONE flush mount albums. Choose the layout of your cover, experiment with different combinations of leathers and fabrics, see whole patterns rather than a small swatch, try out different cover images and crops. Cover designs are limited only by your imagination. The Finao Designer gives you the ability to interact with your clients in an exciting new way when choosing a cover for their Finao ONE flush mount album. Developed by Finao with professional photographers in mind, this is a one of a kind presentation tool for your business. Watch your album sales increase when you are able to present your clients with a professional mock-up of the album of their dreams! 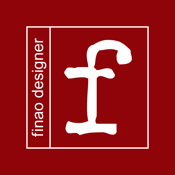 **A Finao account is not required to download and use the app, however a Finao account is required to place orders. Finao accounts are granted to professional photographers only. **Finao albums are hand-made. Images and proportions shown in the app are approximate.